In honor of National Crochet Month (natcromo), Cute Crochet Chat is offering 50% off all our crochet patterns listed in our RAVELRY STORE! This sale will run until 3/31/14 and there is NO LIMIT as to the amount of patterns you can purchase! We have never offered a half-price sale of ALL our patterns before! When ordering patterns from our RAVELRY STORE, enter the COUPON CODE natcromo and receive 50% off your purchase. Now is the time to get any patterns your have been watching in our Ravelry Store! We are offering 118 patterns in this special. This sale will run through to the end of March and there is NO LIMIT as to the amount of patterns you can purchase! We have never offered a half-price sale of ALL our patterns before! Annual Crochetville Designer Blog Tour 2014 Is Here! Crochetville is kicking off National Crochet Month with its annual Designer Blog Tour. My post today, in honor of National Crochet Month showcases two new designs that I just completed. 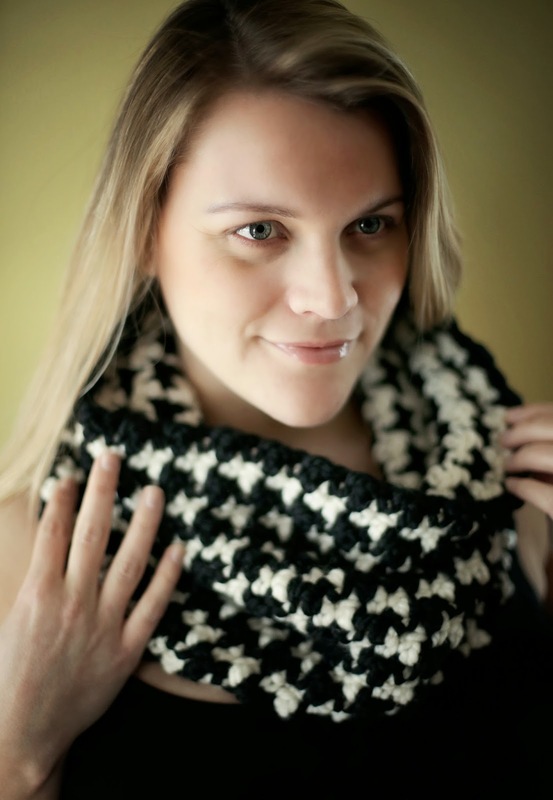 This trendy Houndstooth Cowl is a must accessory for Winter and fashion. Crocheted from a soft blend of 50% Wool and 50% acrylic, this beautiful cowl will keep you warm, yet stylish on a cold day! This cowl is smaller than our other cowls and does not need to be wrapped. Just slip it over your head! Wear it with a coat outdoors or indoors over a sweater. It can be dressed up or paired with your favorite jeans for a relaxed look. A large hook and super bulky yarn makes this a fast project. Beautiful Winter and early Spring accessory! 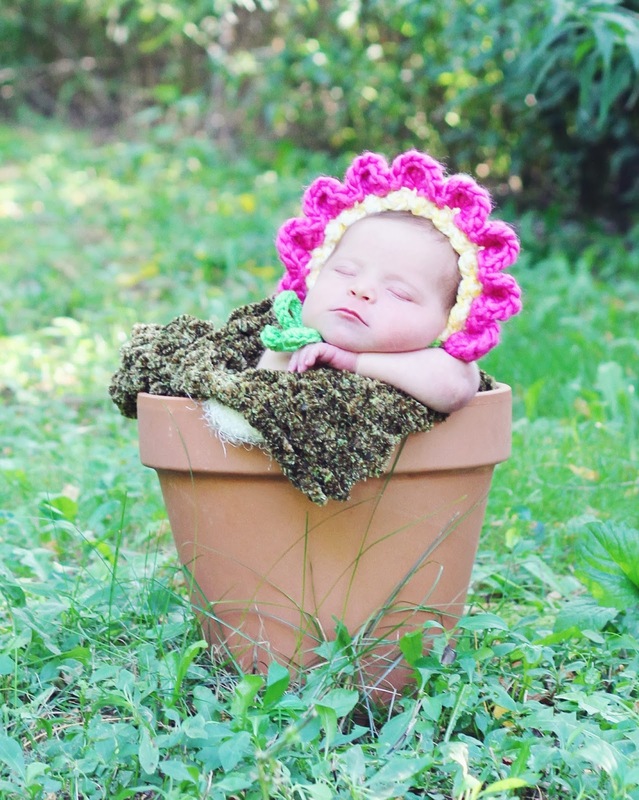 How sweet is this precious little Blossom in the flower pot? Quick and easy crochet pattern written in four sizes from Newborn to 12 months. It is made all in one piece so you don’t have any petals to sew on afterward! Much easier than some Flower Bonnet patterns! This adorable flower bonnet is not only trendy for today’s photography, but also a fun & easy project! #5 Bulky yarn & a large hook make this a quick pattern to crochet. to read more about our project and visit links to free hat patterns. You may send your hats to Crochetville’s main office, otherwise known as Amy’s home. She will count all the hats and deliver them directly to Pam and Halos of Hope at Stitches South in Atlanta on Friday, April 11. The Stitches South hat collection drive will focus on animal-themed hats that will be given to Children’s Healthcare in Atlanta. My dear friend, Jenny King is also posting about NATCROMO today! Check her out HERE! Crochetville has received a lot of support from the crochet community over the years. We believe strongly in the importance of giving back. In 2013, Crochetville became a corporate sponsor of a wonderful organization called Halos of Hope. Halos of Hope is a 501(c)3 not-for-profit organization founded by Pam Haschke, herself a survivor of inflammatory breast cancer. Halos of Hope’s mission to provide volunteer-crafted hats to cancer centers across the country.